Bula!, a word you hear many times a day in Fiji, means "hello" and is always pronounced with a smile. Fiji holidays are the experience of a lifetime and your chance to escape to a world without stress. Fiji is renowned for its stunning beaches, beautiful warm climate, and its unique relaxed island atmosphere. You won't be able to escape the friendliness of the Fijian people or the sheer natural beauty - get ready for swaying palms and warm, clear water. 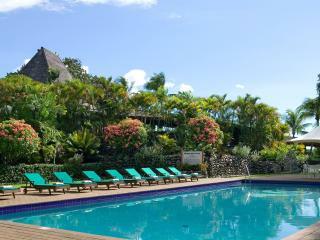 There is a huge choice of Fiji Accommodation. 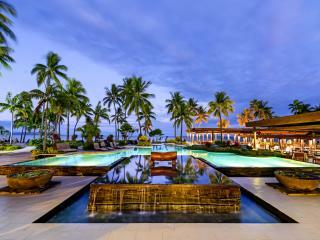 In fact there are over 50 resorts and hotels spread over the 320+ islands that make up Fiji. Many hotels and resorts are located on the largest 2 islands of Fiji, Viti Levu and Vanua Levu while others are situated in the private oasis of the smaller island groups such as the Mamanuca and Yasawa Islands. These islands may contain a small number of resorts or even just a single resort. The facilities available at Fiji resorts vary greatly. Some resorts boast day spas, fully equipped gyms, huge lagoon style pools and modern rooms with all the modern holiday accommodation conveniences while others are aimed at budget travellers or those desiring an escape from the modern way of life. Fiji holidays can take any form you prefer. Spend your days relaxing by the pool and nights strolling the beach or dining in style, or pack your days with activities like snorkelling, diving, parasailing or golf. If you're looking for some nightlife, why not take in the atmosphere of a cultural show or nightclub. Many Fiji tours are available to explore the islands and Fiji cruises are also a great way to experience what this beautiful part of the world has to offer. The list of Fiji activities offered by the various resorts is almost endless. 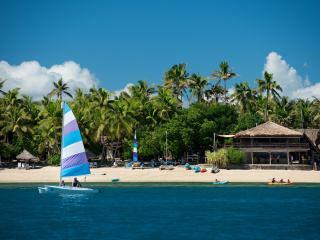 One of the reasons for Fiji's popularity as a holiday destination is the beautiful climate of this region. Temperatures are always between 26 to 31 degrees with the favoured time of year for travel from around April to October, those being the cooler months. There is always a cool tropical breeze and the water temperatures are always perfect. The wet season occurs from December to March and can bring heavy rain. Tropical cyclones have also been common in recent years around this time. Visit our Fiji Weather page for more details. A packaged holiday to Fiji will help to take any stress out of your holiday with all of your accommodation, flights, transfers, tours and meals taken care of. We have a number of special Fiji holiday packages to choose from and even these can be further customized to suit your individual needs. Our travel consultants have travelled extensively in Fiji and can assist you with all aspects of your holiday planning to ensure you get the best possible package and price. Fiji consists of over 320 islands many of which are not inhabited. The main island Vitu Levu contains the capital Suva in the east and Nadi (pronounced "Nandi") on the west coast. Nadi is the location of the international airport where holiday visitors arrive. From Nadi travellers make their way to accommodation on this island or transfer to the smaller islands, often after an overnight stay on Vitu Levu. 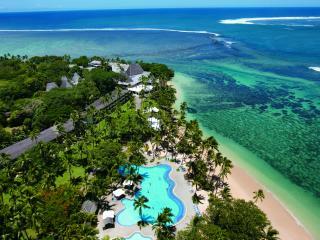 The Mamanuca Group of islands are located very close to Nadi and contain a number of popular island resorts. Transfers to the closer islands are easily facilitated by boat, with air transfers being more common for the outer islands and those further away.